The pasteurization of milk is the reason why some people have developed the allergy to this product. Milk intolerance or lactose intolerance is spread worldwide and affects almost 75% of the adults. Symptoms of this intolerance include stomach problems, such as diarrhea, constipation, heartburn, abdominal pain, colic, ear infections, asthma, headaches, irritability, and different skin reactions. Usually, these patients are advised to avoid processed milk and food which contain lactose, casein or whey. Also, specialists recommend using substitute for milk, like soy, almond or rice milk. Homeopathic approach/solution is somewhat different. The homeopathic practitioner will try to find what causes the milk intolerance and cure it, rather than just deal with symptoms of the condition. The successful treatment will enable a patient to safely drink milk, without any problems. Homeopathic appointment is actually an interview, where the practitioner tries to find out as much as he/she can about the patient's lifestyle, habits and personality, since everything is considered important for choosing the appropriate remedy. There are many remedies to choose for this particular condition. Every patient is different and will get a special remedy, according to the symptoms and personality. 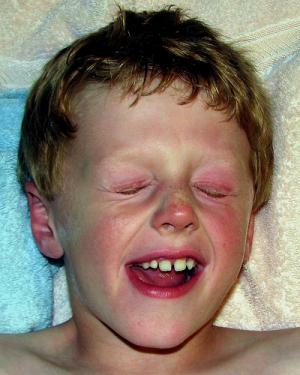 Aethusa – used in children suffering from alactasia, which is a congenital disorder. These children vomit milk, usually in projectiles, and experience colic and weight loss. Apis – honey bee remedy, suitable for anaphylactic reaction to milk. Patients have swelling and breathing problems, urticaria, itching, redness, and heat intolerance. Natrium carbonicum – is suitable for many food intolerances. These people suffer from indigestion, ulcers and heartburn when eating the “forbidden” food. Sometimes, they have problems with diarrhea and gases. They usually crave for sweets and potatoes, and are sensitive to weather and temperature changes. Magnesia muriaticum – is the remedy for people unable to digest milk. Those patients usually suffer from headaches and liver problems, and feel irritation after waking up. These people suffer when criticized, and they are usually those who try to find the compromise. Sometimes, patients were abandoned in the past and that still reflects onto them, and they feel sadness. Sulphur – is meant for egocentric and selfish patients. As physical symptoms, they suffer from diarrhea in the morning, bloating and burning abdominal pain. Mentally, these people might have great ideas but are too lazy to do it themselves. Make sure you consult a qualified homeopathic practitioner to provide the best possible solution for your milk allergy. Homeopaths with CCH or DHANP credentials might be the best choice for you, because they are certified at a high standard. Recurring Skin Rash In the Same Spot! main risk factors for Lactose intolerance? how does a person get homeopathic certification?